I love chapstick. Sooner or later, every Winter, there comes a day when my lips start to feel a little dry, a little sore, and I go rummaging around my top drawer for that little plastic tube with the pink, waxy stuff. It’s always the same tube as last year because, since you use so little of it, it takes longer to consume a whole tube than to read Das Kapital. And it brings instant relief. But for me it’s a whole lot more than that. The sense of smell is mnemonically the most powerfully of the senses. Something you haven’t smelled in years can instantly recall memories you thought you’d lost forever. And the smell of chapstick sends me back to my childhood as few things can. Not the new, flavored stuff, mind you. It has to be the original Chapstick, the one with that smells like wax. I can still remember how I felt like a big boy when my father gave me my first tube. I was maybe five or six. In those days the tube was metal, and it had one of the card suits on the side, like a diamond or a spade, presumably so you could tell yours from someone else’s. And it had that strange, waxy smell, a little like a crayon or a candle, but not exactly like either. Today, I open the cap, apply some to my lips, and when that peculiar smell hits my nostrils, I am transported back to a wintry morning long ago. To my overwhelming joy, there’s been an overnight storm, and school has been cancelled. My sisters and I eat a hurried breakfast, and then dressed in our coats, leggings, hats, mittens, and boots (my mother always dressed us like Eskimos) we head out into the grey, wintry wonderland, dragging our sled behind us. In those days we lived on a hill, a perfect hill for sledding. And so for hours we would ride that sled down the snow covered hill, drag it back to the top, and do it again. The sheer repetitiveness of this exercise never seemed to faze us. When we finally got bored with that, we’d build snow forts and have snowball fights with the neighborhood kids. Finally, just before four in the afternoon, with the grey light fading into dusk, my mother would call us in. We never argued, partly because by then we were numb, but mostly because four o’clock was when Sesame Street went on. By then we’d be in dry, warm clothes, sitting in front of the TV, eating the peanut butter and crackers and drinking the hot chocolate our mother had made for us as we watched Big Bird and Cookie Monster, while a fire crackled and popped in the fireplace. When we went to bed that night we’d pray for another snowstorm. That one smell brings me back to a time when I felt safe and happy, before I knew what anxiety, sadness and depression felt like. In this world my parents are still young, my grandparents are still alive, and there is always something fun to look forward to. For just a moment I am a child again, back in a world that I am not afraid to live in. I am a traditionalist. For me it is the original or nothing. It’s that smell that makes me want to use it. never liked change but have learned to deal with it. they make me laugh, but i feel lucky to have them. Memories are part of who we are. What are we without our memories? I have always preferred Carmex and the little jar makes a handy weapon. Strange…. 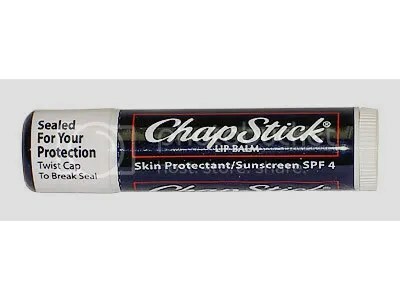 not two days ago I was thinking about one of my favourite items and thought I should write a post and maybe start a category…..
i love chapstick too! i keep three tubes on my desk of different flavors. i’m not so much a fan of the wax flavored but i do love the instant relief. actually me and two other girls here have a ritual, one of us will yell out “sychronize your chapsticks” and we all grab and soothe! it’s fun and something i look forward to here at work. i’m glad yours gives you such nice memories.